Will Demand CS on the outside of the house work for cluster flies? How do I get rid of/prevent cluster flies (hundreds) They do die......but "after" they are in the house. Demand CS is not a contact kill so once a fly contacts a treated area it could still get inside before it succombs to the insecticide, but that does mean that it is working. If the cluster flies have already made their way indoors they will be harder to control because they usually hide in a wall void or other inaccessible area and are only visible when the house warms up. If the cluster flies are in an attic or drop ceiling or other dark area, a fly light would do a great job controlling the population. Using small fly lights such as the FlyWeb Fly Light in the house would also help to catch the flies. Spray Talstar directly on baseboards, window frames, door frames, and places where utilities (pipes, wires, cables) enter in to the building and any other crack, crevice or gap where insects can enter. We also have a great guide here on "How to Get Rid of Cluster Flies" that might help. Which is better for perimeter outside Demand CS or Termidor Sc? Demand CS would be a great choice for general pest control for common insects found in and around the home. It can be applied every 90 days indoors and every 30 days outdoors. Termidor SC should ONLY be applied once every 6 months directly up against the structure on the exterior of foundation (1 ft up and 1 ft out). You should NOT apply Demand CS in the areas where you apply Termidor SC. Please refer to the product label prior to mixing and applying for complete usage instructions. Does Demand CS kill mold? Does Demand CS kill mold? we are facing a mold issue in guest's room and Pest control company used Demand CS to spray all rooms, just wanted to know if this chemical kill mold? No, Demand CS is not labeled to kill mold. It is only an insecticide. The only mold remediation product we sell is Boracare with Mold-Care, which can be used on raw structural wood for mold remediation and prevention. Would Demand CS hurt the finish on marble floors? 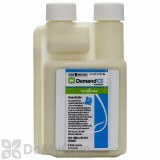 Demand CS is a water-based insecticide and should not cause damage to any surface that water would not damage. I have Demand CS, how much should I use to kill the tiny black jumping spiders? I have used this spray already a few weeks ago, yet I still see the tiny jumping spiders crawling on areas where I sprayed. The spray definitely works on regular house spiders. What should I do? Demand CS is a great choice for spider control, but it will take some time for death to occur. For clean out or severe infestions of spiders, including those black jumping spiders, you would want to mix 0.8 fluid oz (24 mL) of Demand CS per gallon of water. Be sure to spray the outside perimeter of your home, spraying 2 to 3 feet up the side of the house and 2-3 feet out on the ground. Also make sure to spray all of your baseboards, any cracks or crevices, window frames and door frames both interior and exterior, or any other place where spiders could gain entry into your home. Can Demand Cs be used outside in Cold weather? During what type of temperatures should I not use Demand CS outside around the perimeter of the home. As long as it is not freezing outside you can safely use Demand CS outdoors. Since the product is water based trying apply it in below freezing temperatures would not yield positive results. I used D-fense SC (Active Ingredient : 4.75% Deltamethrin) but it did not get rid of my Stink Bugs in the house. So I have 3 questions. #1 Can I use Demand CS right now even though I sprayed the D-fense SC? $2 What areas do I need to spray Demand CS? Is spraying the window frames, house brick walls, and foundation good enough? #3 Lastly is Demand SC safe on aluminum window clad and composite frames? Yes, you can use Demand SC even though you have already sprayed, although you would want to wait 7 days between treatments. Stink Bugs will try to emerge in the spring and common places that people find stinks bugs are in the window sills and this is a great place to treat along with the baseboards, back behind and underneath appliances, in attics, and where pipes enter the the wall. Demand SC is safe on aluminum and composite frames and will not harm any surface that is tolerable to water. How to get do I rid of caterpillars invading my house. I've already sprayed a chemical from Home Depot around my house a couple of months ago and now they are back. You can use a product like Demand CS around the perimeter of the home and inside as well. We have a great video here for General Spray Application to show you where to spray. Demand CS should be applied once a month outside and once every 90 days inside. It will not provide an instant knockdown but will instead continue to kill after it has dried. How can I stop Demand CS from staining the wood floors? I spay demand sc and it stains the wood floor and base boards. It can then be wiped off but is a pain too do. I used pest tabs in the past and did not have this problem. What should I do to eliminate the stains? If Demand CS is leaving a visible residue, then we would recommend to use a lower dilution rate (0.2-0.4 oz. per gallon of water). Also, be sure you are only spraying as a spot and/or crack and crevice treatment. You could also consider going to an insecticide that is not micro-encapsulated, such as Talstar P. If you are removing all the reside, then you would need to reapply the insecticide. What is the best product to use for ants and spiders inside and outside of my home? Demand CS would be a great option for both indoor and outdoor treatments for spiders, ants and a multitude of other insects. You can refer to the product label for dilution and treatment instructions. The Demand CS will ususally last up to 90 days indoors and at least 30 days indoors. How long does Demand CS last, and what is the retreat time? Demand CS a micro-encapsulated product and would give you a 90 day residual. Depending on the pest you are treating for you can may applications monthly if needed. Please refer to the product label for specific applications times. Do I have to worry about Demand CS harming nearby small bird families ? I want to thoroughly spray the outside of my house about mid August. Small birds tend to fly around my house a lot as they like to nest under my porch. When used as directed on the product label, Demand CS is safe to use outdoors in areas where birds frequent. Be sure the birds are out of the area when the Demand is being applied and try to keep the birds away until the area is dry. I'd like to spray my yard with Demand CS for ticks. However, we have a TON of (now flowering) clover this year, and the bees are everywhere. I certainly don't want to risk hurting them ! This also brings up another question- are there any other "good" bugs that Demand might kill inside or outside the house besides bees ? Thanks. Demand CS is not a selective insecticide and it will kill most insects that contact the treated area. We recommend learning how to create a tick free zone around your yard and only spraying in those areas where ticks are known to inhabit. Make sure the property around your home is unattractive to ticks. Because ticks are sensitive to dry conditions and do not thrive in short vegetation, they are seldom a problem in well-maintained lawns. Keep your grass mowed and keep weeds cut. Clean up items that attract rodents which can carry ticks, such as spilled birdseed, and hiding places like old wood piles. If ticks are present in vegetation along the edge of the property, insecticides labeled for control of ticks can be applied to small areas of high weeds that cannot be mowed. Often, one or two applications per season will be adequate to control ticks in these areas. What is the shelf life of Demand CS and D-Fense Deltamethrin Dust? Demand CS has a shelf life of about 3 to 5 years when stored in a cool dry area. D-Fense Deltamethrin Dust has a shelf life of 3 years from the date of purchase. Can Demand CS be used for ladybugs indoors? Yes, Demand CS can be used for ladybugs. What is the mix rate for using Demand CS when using the Chapin Wet/Dry Hose End Sprayer for Japanese Beetles? When using a Chapin Hose End sprayer connected to a water hose, what should I set the dial at in order to kill Japanese beetles? When using Demand CS to treat Japanese Beetles, the mix rates vary depending if you are treating the lawn or ornamentals. Please refer to the product label for application instructions. Ornamental Rates: 0.4 - 1.3ml (1.5 to 5fl oz) used in 25 gallons of water. For spot treatments, use 0.5 fl oz Demand CS Insecticide per 1–2 1/2 gal of water. Since water is acting as the carrier, each treatment and the amount of water that will be used is specific to the individual treatment. Please take a moment to review our How to use the Chapin Wet or Dry Hose End Sprayer Video for tips on how to set the dial for this sprayer. Can you apply Demand SC directly to a bed (mattress) where humans sleep? Friend has fleas/ticks in her house she wants to know if it’s safe to apply it to her bed because she sleeps with her dog. No, Demand CS is NOT labeled for applications to mattresses where humans sleep directly for your safety. NyGuard Plus is labeled for ticks and fleas and it can be applied to the mattress. Spray only surfaces that cannot be laundered or dry-cleaned including mattresses and upholstered furniture. Apply on mattresses as a spot treatment to mattress seams, edges, buttons, and tufts of bed only. Do not use directly on pillows, bed linens, or cloths. Do not saturate the mattress and do not treat entire surface area of the mattress. Allow mattress to dry thoroughly before replacing pillows and/or bed linens. You will wash and dry linens in heat to eradicate any present fleas or ticks and allow the product to completely dry prior to making the bed. Please take a few moments to review our How to Get Rid of Fleas and How to Get Rid of Ticks articles for more detailed information. How many ounces of Demand SC should be used in 1 gallon of water for scorpions? We recommend using the max use rate of 0.8 fl oz or Demand CS per gallon of water for scorpion control. 0 of 2 people found this answer helpful. Will Demand CS bond to vinyl siding like it does to paint? Demand CS will bond to just about any surface including vinyl siding which is one of the reasons why it is considered to be one of the best products on the market. How do I safely clean up Demand CS that has been sprayed on the floor instead of in cracks/crevices? We used Demand CS to control carpet beetles but we incorrectly sprayed the product along the floor, about a foot from the wall, around the entire perimeter of our condo (rather then just using as a crack/crevice treatment). What is the best way to clean our floor to remove the product? We are concerned about our little dog walking on the product. Demand CS can be wiped up with hot water and soap. The product is safe for your dog even if over sprayed on the floor after it has completely dried.